Do you remember the first time you realized Google could search for images? If you’re like me, it was also likely the first time you realized you could grab any of those images for your PowerPoint slides or blog articles. After all, they’re in the public domain, right? Wrong. I’m likely not the first to tell you that just grabbing those images is a “no-no”, but let’s be clear: you should not do it. You never know when someone else has infringed on another person’s copyright and by grabbing the image, you’ll be furthering that infringement. The result? Could be nothing – or it could be hefty legal fees (or worse). Because I speak at conferences a decent amount, I regularly need great images to help me get my points across. If you’ve ever looked at my slides, you’ll note that they often have large images with very little text on them. After all, visuals are meant to help with my message, not be my message. But to help evoke the emotions I’m looking for, I want large and striking images. So I’m often asked where I get these images (which I also use on this blog). One place I regularly tell people about is Flickr. 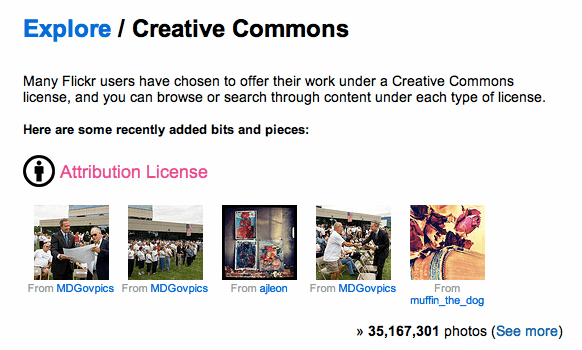 If you head to the creative commons area of the site, you will find images that you can use and manipulate for free. It’s the first group listed (as you’ll see in the image above). Now, getting an image from here does require that you let others know where you got the image from – which is called an attribution license. But that’s pretty cheap, since it’s just typing some words. When you click on the “see more” you’ll be able to enter search terms and find what you’re looking for. After you do a search, you’ll see a toolbar above the search results (see below). I suggest you click on “Interesting” because it looks for images that have the most comments and brings them to the top. It’s a pretty quick way to find some good material that will potentially create the reaction you’re looking for. While Flickr offers some very interesting images, it doesn’t always hit the spot. That’s why for the last few years, I’ve been using ShutterStock. They’re a different kind of image repository (than istockphoto, for example) because they don’t charge by the picture (though they’ve recently introduced a pay by image program). Instead, you pay a single monthly fee and are able to download up to 25 photos (hi-res) a day. Read the terms of their license, however, because you have to use the images within 6 months (no stock piling). So what I’ve been doing is turning on 1 month’s subscription, with a list of keywords already prepared, and daily (for a straight month) downloading my 25. That’s over 600 high res images and they last me about 6-8 months before I have to do it again. Ok, they’re not new, but they’re new to me. The company is called PhotoSpin and for under 2 months of ShutterStock prices, you get a year’s worth of downloads! They let you download 50 a day, with a max of 750 a month. That’s incredible.